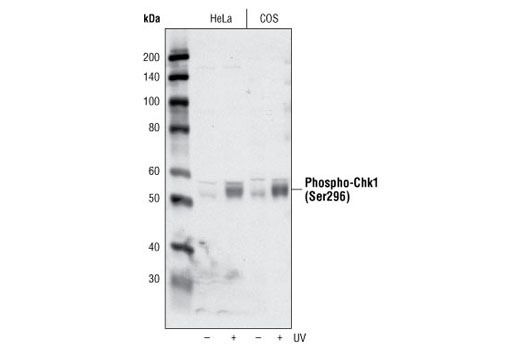 Western blot analysis of extracts from Hela and Cos cells, untreated or treated with 100 mJ/cm2 UV light with 1 hour recovery, using Phospho-Chk1 (Ser296) Antibody, #2349. 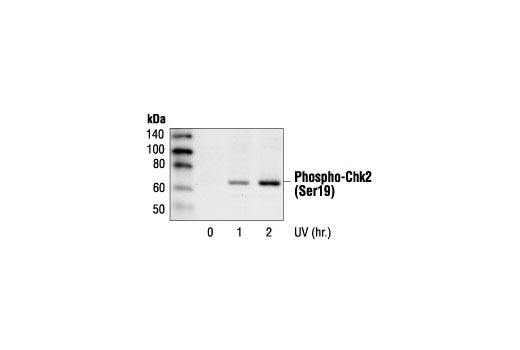 Western blot analysis of extracts from 293 and NIH/3T3 cells, untreated (-) or UV-treated (100 mJ, 1 hr recovery; +), using Phospho-Chk1 (Ser317) (D12H3) XP® Rabbit mAb. The blot on the right was treated with calf intestinal phosphatase (CIP) before western blot. 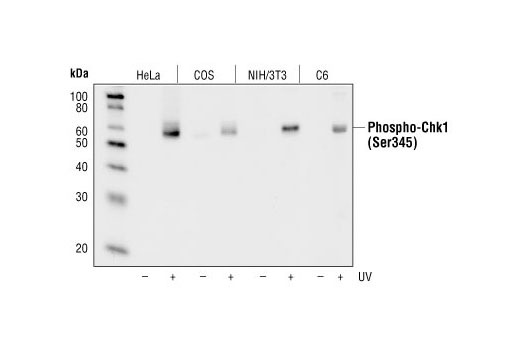 Western blot analysis of extracts from HeLa, COS, NIH/3T3 and C6 cells, untreated or UV-treated, using Phospho-Chk1 (Ser345) (133D30) Rabbit mAb. Western blot analysis of extracts from Hela and Cos cells, untreated or treated with 100 mJ/cm2 UV light with 1 hour recovery, using Phospho-Chk1 (Ser296) Antibody. 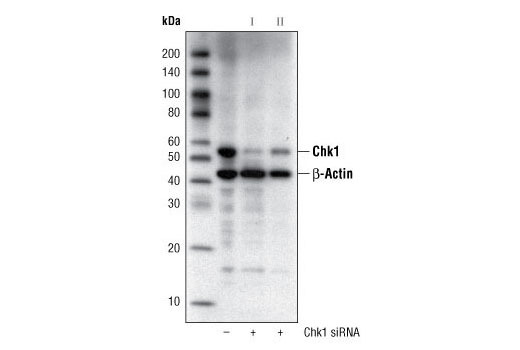 Western blot analysis of extracts from various cell lines using Chk1 (2G1D5) Mouse mAb. 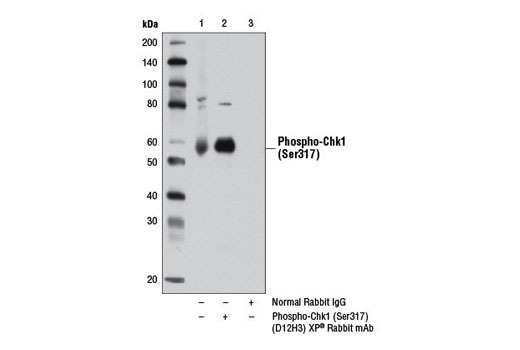 Western blot analysis of extracts from various cell lines using Chk2 (D9C6) XP® Rabbit mAb. Western blot analysis of extracts from COS cells, untransfected (lane 1) or transfected with Wild-type Chk2 (lane 2), Chk2 (S19A) (lane 3), Chk2 (T26S28A) (lane 4), Chk2 (S33S35A) (lane 5) or Chk2 (T68A) (lane 6), using Phospho-Chk2 (Ser19) Antibody. Western blot analysis of extracts from COS cells, untransfected (lane 1) or transfected with Wild-type Chk2 (lane 2), Chk2 (S19A) (lane 3), Chk2 (T26S28A) (lane 4), Chk2 (S33S35A) (lane 5) or Chk2 (T68A) (lane 6), using Phospho-Chk2 (Ser33/35) Antibody. 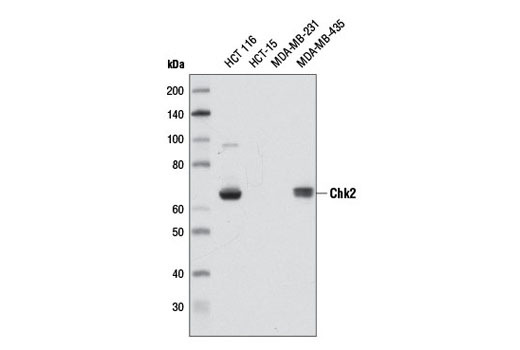 Western blot analysis of extracts from HeLa cells, untreated or UV-treated, using Phospho-Chk2 (Thr68) (C13C1) Rabbit mAb. 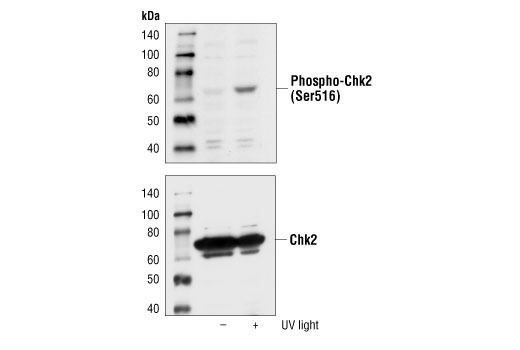 Western blot analysis of extracts from 293 cells, untreated or UV-treated (50 mJ/cm2, 2hrs), using Phospho-Chk2 (Ser516) Antibody (upper) or Chk2 Antibody #2662 (lower). Immunoprecipitation of phospho-Chk1 (Ser317) from 293 cell extracts treated with UV (100 mJ, 1 hr recovery) using Phospho-Chk1 (Ser317) (D12H3) XP® Rabbit mAb (lane 2) or Rabbit (D1AG) mAb IgG XP® Isotype Control #3900 (lane 3). Lane 1 is 10% input. Flow cytometric analysis of HeLa cells, untreated (blue) and UV-treated (green), using Phospho-Chk1 (Ser345) (133D3) Rabbit mAb. Western blot analysis of extracts from HeLa cells, transfected with 100 nM SignalSilence® Control siRNA (Fluorescein Conjugate) #6201 (-) or SignalSilence® Chk1 siRNA I #6241 or SignalSilence® Chk1 siRNA II (+), using Chk1 (2G1D5) Mouse mAb #2360 and β-Actin (13E5) Rabbit mAb #4970. 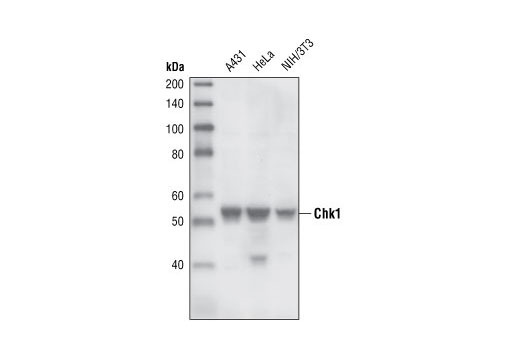 Chk1 (2G1D5) Mouse mAb confirms silencing of Chk1 expression and β-Actin (13E5) Rabbit mAb is used to control for loading and specificity of Chk1 siRNA. 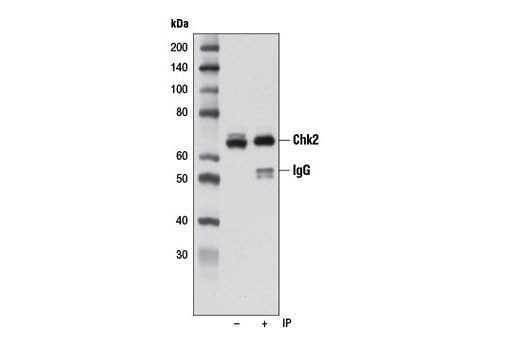 Immunoprecipitation of Chk2 from 293 cell extracts using Chk2 (D9C6) XP® Rabbit mAb (lane 2). Western blot detection was performed using the same antibody. Lane 1 is 10% input. 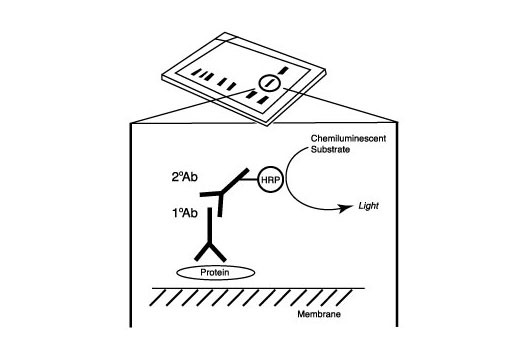 Western blot analysis of extracts from HeLa cells treated with UV for the indicated times, using Phospho-Chk2 (Ser19) Antibody. 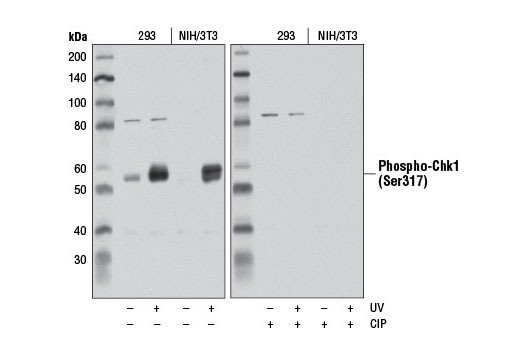 Western blot analysis of extracts from HeLa cells treated with UV for the indicated times, using Phospho-Chk2 (Ser33/35) Antibody. 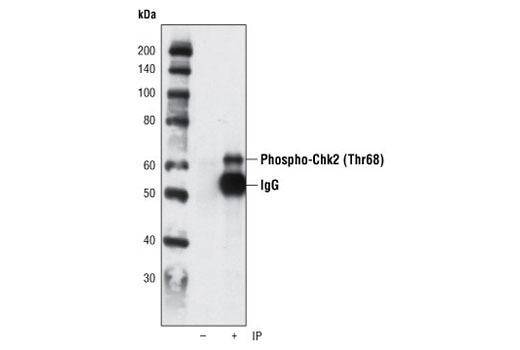 Immunoprecipitation of phospho-chk2 from UV-treated HT29 cells using Phospho-Chk2 (Thr68) (C13C1) Rabbit mAb followed by western blot using the same antibody. 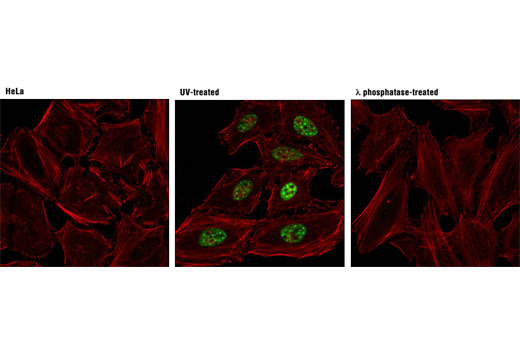 Confocal immunofluorescent analysis of HeLa cells, untreated (left), UV-treated (center), or UV and λ phosphatase-treated (right), using Phospho-Chk1 (Ser317) (D12H3) XP® Rabbit mAb (green). Actin filaments were labeled with DY-554 phalloidin (red). 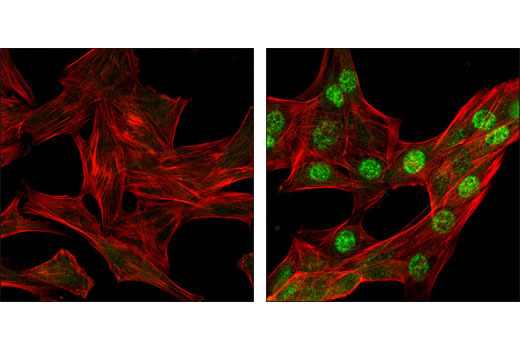 Confocal immunofluorescent analysis of C2C12 cells, untreated (left) or UV-treated (right), using Phospho-Chk1 (Ser345) (133D3) Rabbit mAb (green). Actin filaments have been labeled with DY-554 phalloidin (red). 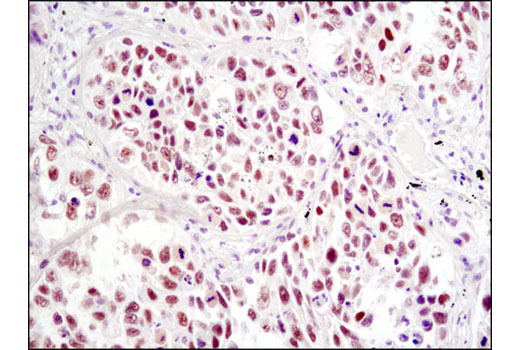 Immunohistochemical analysis of paraffin-embedded human lung carcioma using Chk2 (D9C6) XP® Rabbit mAb. 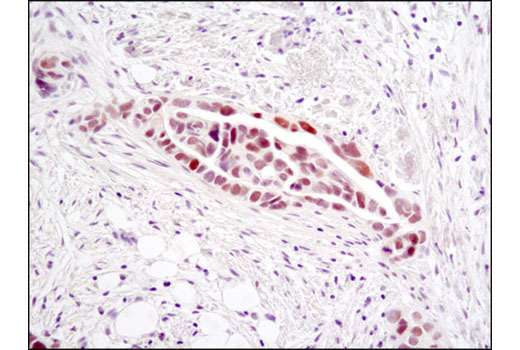 Immunohistochemical analysis of paraffin-embedded human breast carcinoma, showing nuclear localization, using Phospho-Chk2 (Ser19) Antibody. 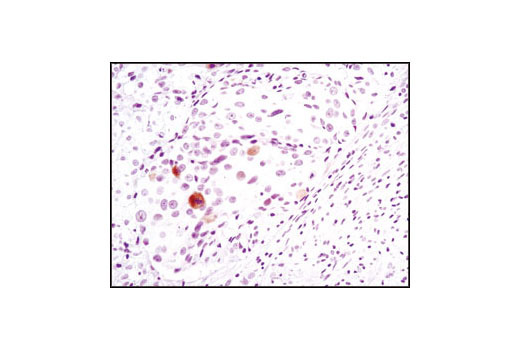 Immunohistochemical analysis of paraffin-embedded human breast carcinoma using Phospho-Chk2 (Thr68) (C13C1) Rabbit mAb. 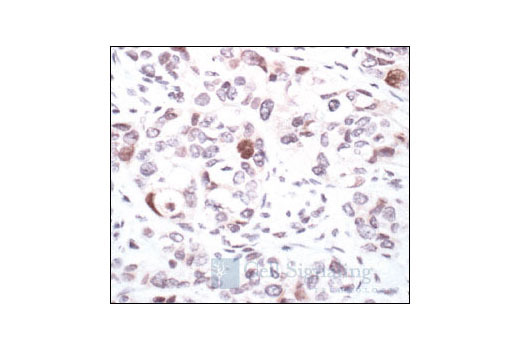 Immunohistochemical analysis of paraffin-embedded human ovarian serous adenocarcinoma using Chk2 (D9C6) XP® Rabbit mAb. 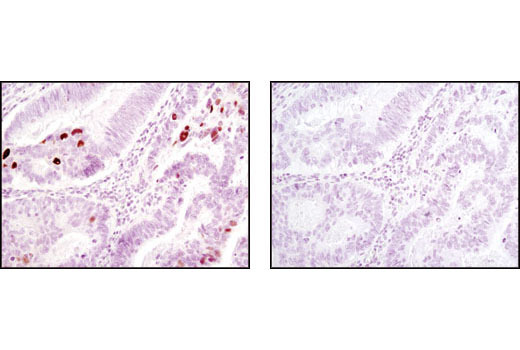 Immunohistochemical analysis of paraffin-embedded human colon carcinoma, control (left) or λ phosphatase-treated (right), using Phospho-Chk2 (Thr68) (C13C1) Rabbit mAb. 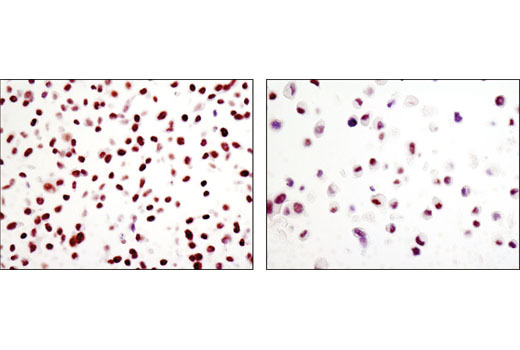 Immunohistochemical analysis of paraffin-embedded cell pellets, HCT 116 (left) or MDA-MB-231 (right), using Chk2 (D9C6) XP® Rabbit mAb. 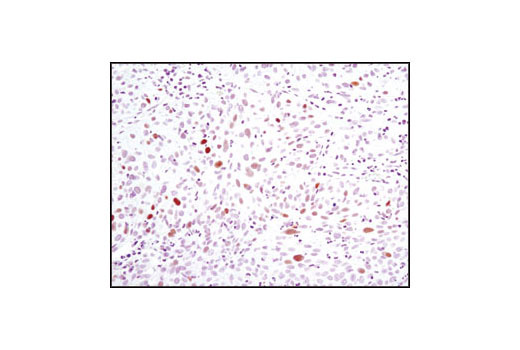 Immunohistochemical analysis of paraffin-embedded human lung carcinoma using Phospho-Chk2 (Thr68) (C13C1) Rabbit mAb. 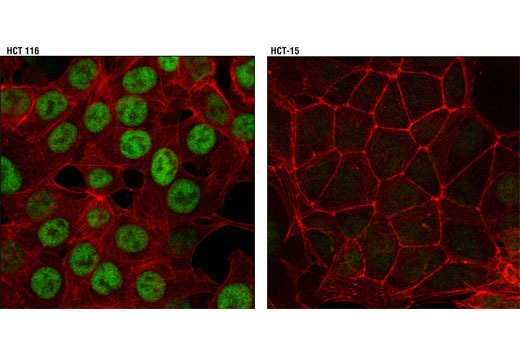 Confocal immunofluorescent analysis of HCT 116 (left) and HCT-15 (right) cells using Chk2 (D9C6) XP® Rabbit mAb (green). Actin filaments were labeled with DY-554 phalloidin (red). 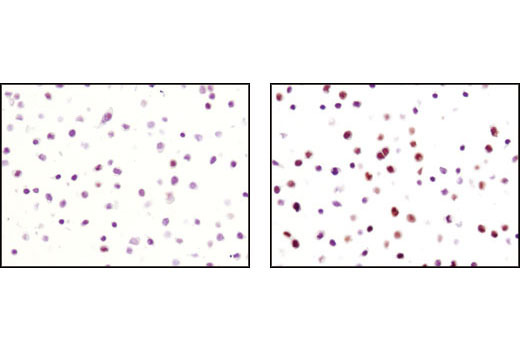 Immunohistochemical analysis of paraffin-embedded HT-29 cell pellets, control (left) or UV-treated (right), using Phospho-Chk2 (Thr68) (C13C1) Rabbit mAb. Flow cytometric analysis of untreated Jurkat cells, using Phospho-Chk2 (Thr68) (C13C1) Rb mAb versus propidium iodide (DNA content). 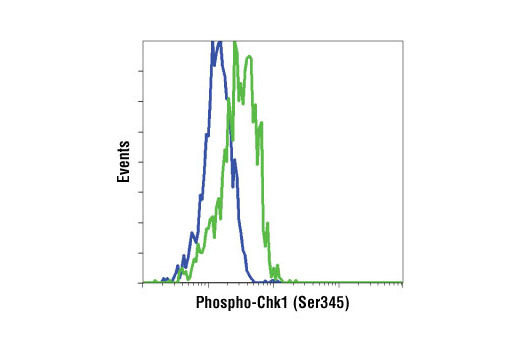 The boxed population indicates phospho-Chk2 (Thr68)-positive cells. 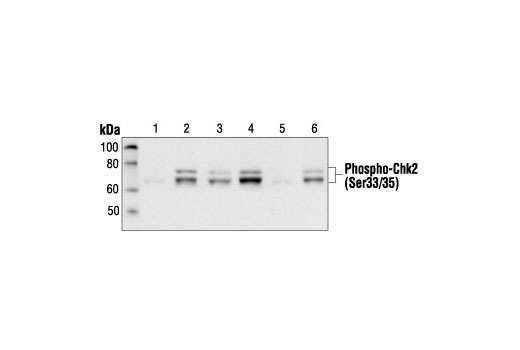 The Phospho-Chk1/2 Antibody Sampler Kit offers an economical means to evaluate the phosphorylation status of Chk1 and Chk2 on multiple residues. The kit contains enough primary and secondary antibodies to perform two Western blot experiments with each primary antibody. 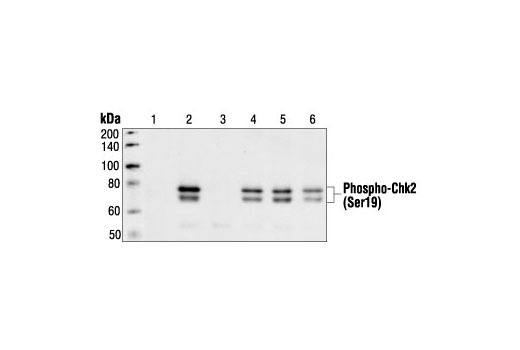 Each antibody in the Phospho-Chk1/2 Antibody Sampler Kit detects endogenous levels of its respective target protein. Chk2 is the mammalian homologue of the budding yeast Rad53 and fission yeast Cds1 checkpoint kinases (5-7). The amino-terminal domain of Chk2 contains a series of seven serine or threonine residues (Ser19, Thr26, Ser28, Ser33, Ser35, Ser50 and Thr68) followed by glutamine (SQ or TQ motif). These are known to be preferred sites for phosphorylation by ATM/ATR kinases (8). Indeed, after DNA damage by ionizing radiation (IR), UV irradiation and DNA replication blocked by hydroxyurea, Thr68 and other sites in this region become phosphorylated by ATM/ATR (9-11). The SQ/TQ cluster domain, therefore, seems to have a regulatory function. 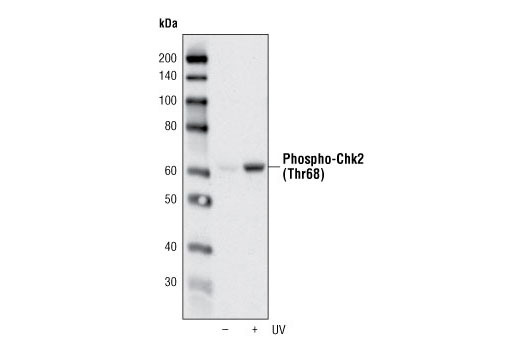 Phosphorylation at Thr68 is a prerequisite for the subsequent activation step, which is attributable to autophosphorylation of Chk2 on residues Thr383 and Thr387 in the activation loop of the kinase domain (12). Allen, J.B. et al. (1994) Genes Dev. 8, 2401-2415. Weinert, T.A. et al. (1994) Genes Dev. 8, 652-665. Murakami, H. and Okayama, H. (1995) Nature 374, 817-819. Matsuoka, S. et al. (2000) Proc. Natl. Acad. Sci. USA 97, 10389-10394. Melchionna, R. et al. (2000) Nat. Cell Biol. 2, 762-765. Ahn, J.Y. et al. (2000) Cancer Res. 60, 5934-5936.